Schnitzelburg Area Community Council: Movie Night in Emerson Park - This Saturday! 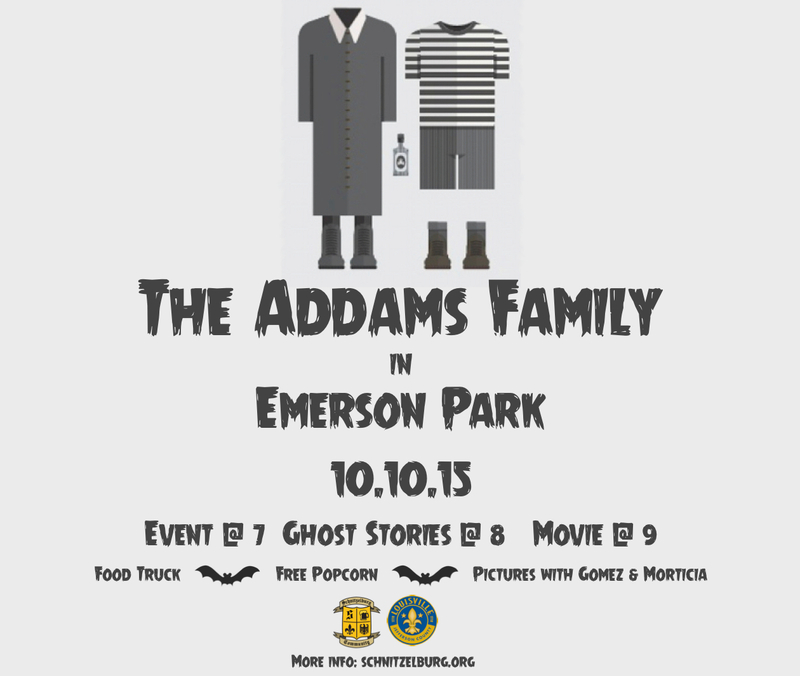 Movie Night in Emerson Park - This Saturday! We've hosted Ghostbusters and a bio-exercist named Beetlejuice, now it's time for the First Family of Darkness to make our acquaintance. Join us on Saturday, October 10th in Emerson Park (corner of Sylvia and Hickory Streets) for Movie Night featuring The Addams Family. The event starts at 7 pm. Meet your neighbors, grab some grub from Red Top Hot Dogs, and get your picture taken with Gomez and Morticia Addams in a replica of their living room in the park's gazebo. At 8 pm, we will have storytellers sharing some spooky ghost stories. The movie will begin at 9 pm and we will have free popcorn for your viewing pleasure! We will have a couple of gift baskets that we will be raffling off before the movie. Items include an Addams Family tee from Block Party Handmade Boutique, two tickets to a local haunted house, Addams Family novelty items, and more! Raffle tickets will be $1 each and available for purchase at the event. Proceeds will go toward SACC's general fund. This is a fun, family event! The first 25 children in attendance receive a free treat bag! Bring your own blankets and/or chairs. It will be a brisk evening, so bundle up! There will be two portable toilets at the park for Saturday. If you absolutely cannot handle this, you can go run over to Check's to use their facilities. Street parking is available along Hickory and Sylvia Streets, but we encourage you to walk or bike if you live nearby. Dogs are welcome as long as your beast is tame! A big thanks to District 10 Councilman Steve Magre and his legislative aide, Carrie Peers, and Louisville Metro Parks for supporting this event!